India's wall-climbing extreme athlete is also its cutest snake: The wolf snake, Lycodon aulicus. These snakes are quite aggressive and quick to bite, but they are non-venomous and their bite is just a prick -- which I know because I've been bitten many times. In fact, most of my friends think the wolf snake is "cute" when he bites! The common wolf snake is brown with white stripes on the back and beautiful irregular stripes on the sides. Some common wolf snakes are also black in colour and have yellow stripes instead of black, and their length varies from 50-80 cms. Many rescuers would agree with me that these snakes are quite restless, almost like a toddler running around,curious to find new and interesting things. In fact, their childlike nature is, to me, their most endearing quality! I recently rescued a common wolf snake from one of my collegue's property. When I received the distress call, I guessed that the snake might be on the ground and it might be a rat snake or a cobra. Upon reaching his property, I was told the snake was on the second floor and that it had recently eaten a gecko. I was sure it was a wolf snake. I reached the second floor and I peeked over the wall and saw the wolf snake coiled in a corner. I caged the snake and left it near a river bank in about 15 minutes. It was a learning experience on the whole as unlike my previous experiences the snake didn’t attack much as it had ingested a good sized wall lizard. These non-venomous climbers are good predators and survivors, and to me, they are always beautiful and “cute” as well. 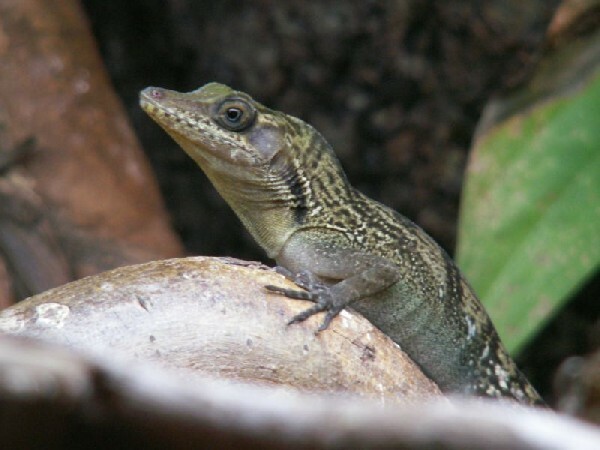 Herp Photo of the Day: Vinales Anole! It's our herp photo of the day, uploaded by kingsnake.com user macraei! The calls of the various anurans were almost deafening as we maneuvered the motor canoe in and out of the beds of floating water lettuce and hyacinths. Pings, squeaks, grunts, groans, beeps, and clicks of various pitches and intensities intermingle and require stopping and listening intently to sort out. Most of the callers were hylids (treefrog family) but occasionally a few leptodactylids (tropical frogs) would also call. Three of the frog species we were searching for were prominent in this chorus. They were the the 3 taxa of hatchet-faces, treefrogs of the genus Sphaenorhynchus. Although a rather silly analogy, I have come over the years to think of the 3 as the "3 bears" with Baby Bear being the 1" long S. carneus, Mama Bear being the slender 1 1/2" long S. dorisae, and Papa Bear being the robust 1 3/4" long S. lacteus. Despite being hylids, these 3 frogs are predominantly aquatic and large numbers of each may be found amidst the islands of aquatic vegetation (especially water lettuce) throughout the year. Besides the size difference, these 3 also differ in call and in appearance. The tiny S. carneus produces a series of rapidly repeated clicks and has reddish dorsolateral stripes. S. dorisae has a rounded snout and lacks striping and produces a series of pinging notes. And S. lacteus has a sharply pointed nose, white canthal (snout) stripes, and its call is a single cluck. Renewing our acquaintance with these 3 taxa and their fellow songsters is always one of the most enjoyable aspects of our Amazonian tours. And of course there always the chance of seeing a black caiman as well. This is herping at its neotropical best. 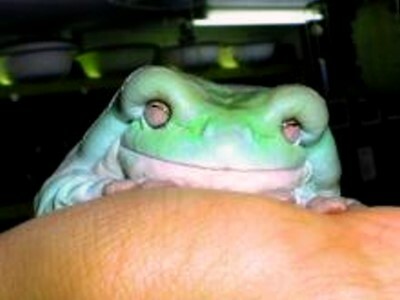 Continue reading "Hatchet-faced treefrogs are just right"
Herp Photo of the Day: White's Tree Frog! It's our herp photo of the day, uploaded by kingsnake.com user Reptiles_Impact!